It's Wednesday! Which means its time to Hoedown with Hambo Stamps! Some big changes have come to the Hoedown, so be sure to check it out! If you don't play along because you don't own some of the fun images, be sure to read the blog for some great news!! Since this past weekend, I had been nursing my son who wasn't feeling well. He was miserable all weekend and I took him into the DR Monday to find he had Strep. That always calls for good times! :) Thank goodness for modern medicine. Those meds kicked in pretty quick to at least relieve some pain and swelling. He is on the fast road to recovery now! This weeks challenge is to incorporate a large and small element into your project using this adorable image of Bear Cupcake. You just attach one end to your image and the other to your project. Super easy! Here it is in "action!" Hopefully, that didn't make a you a little crossed eyed.. lol! I also made this project a to be a gift box/card to hold some sweet treats. 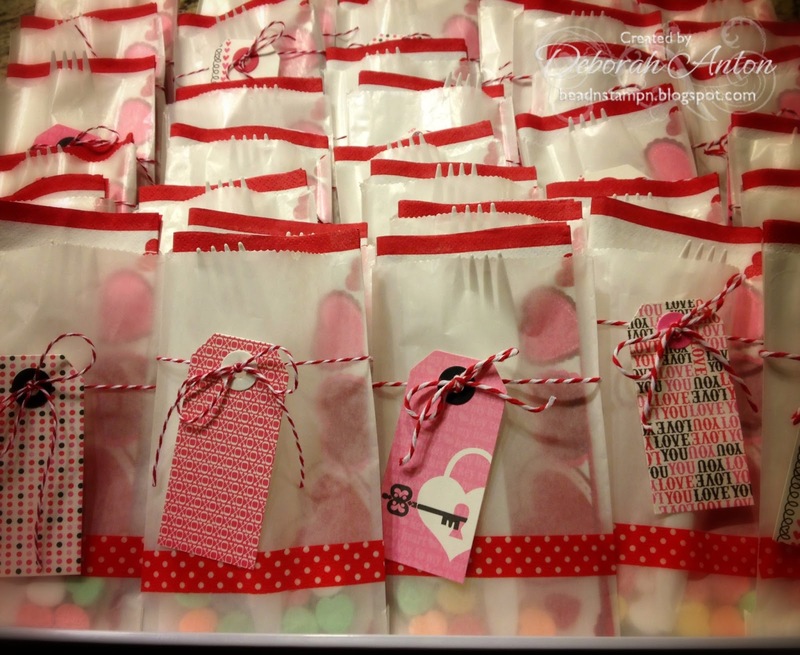 Fun to give to someone who needs a little pick me up. When you open the box, which is held by some Velcro, it reveals the sentiment and the "card" to pull which will have the sweets. 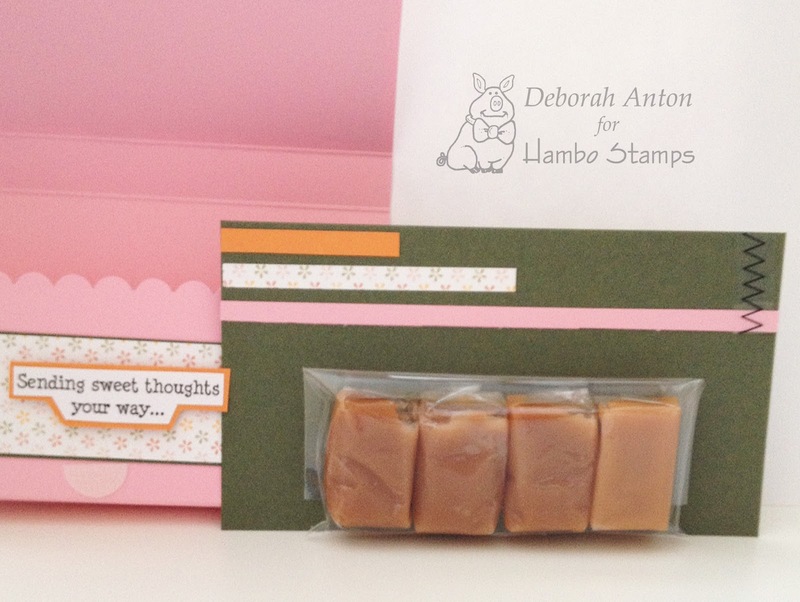 In this case, I placed 4 Fleur de Sels Caramels into a plastic pouch and adhered it to the card. I finished the card with some matching dp and a small stitching sticker from SRM. It was fun to make this little box/card as I always enjoy giving treats to the teachers or friends. I will have to create more similar projects to hold other goodies. Thanks so much for stopping in and be sure to check out the other fabulous creations from the Bacon Bits at the Hoedown. Have a great day! It's Tuesday and that means another fabulous Timeless Tuesday Challenge. Broni is our hostess and her challenge to you is to Sparkle and Shine! Whip out those glitters and glazes and dazzle! MME DP was used in different patterns while the flowers were cut out using MFT's Die-namics. For the main sentiment focal point, I used Inside & Out You. I went over the sentiment 'Thinking of' with my Copic Spica pen and the 'You' was gone over using Sakura Glaze Pen in black. I used some pearls for the center flowers and used glitter over them. I finished the card with a hint of rhinestones for some extra sparkle. Be sure to check out the other fabulous creations from the Timeless Tuesday Team! Bridget Finlay, our February guest designer! Thanks for stopping by and taking a peek! Have a great Tuesday! A Special Birthday Hop for Flourishes Jan Marie! Here’s the scoop, there’s a way YOU can help Jan celebrate and win some Flourishes stamps as well! HOW? Simply be inspired by the photo above and create a birthday card for Jan. Just that simple! We just love creative challenges at Flourishes and so, why not usher in another one! One randomly drawn winner will get a $25 gift certificate to the Flourishes store, just for playing along! You have until next Thursday at 6PM EST to enter and we’ll draw and announce a name next Friday, right here on the Flourishes blog! Use Flourishes stamps if you have them, and if you don’t – play along and wish Jan a Happy Birthday anyway! If you upload to SCS, please use the key word FLLCBDAY13. And, once you are done with your creation, don’t forget to link it up below using our Inlinkz widget! Happy Birthday Jan! I hope your day is filled with much love & surprises, surrounded by friends and loved ones! My card is made using some dp from MME and using the new release of Roses Are Red, accented with the newly released Victorian Oval Die set. The image is colored with Copics using the Lenten Rose collection. The sentiment is the Inside and Out set Happy. I finished it with some self adhesive pearls and silk ribbon. The inside is finished using the same dp's and finishing sentiment from Inside and Out Happy. One extra note? Jan may be the head of this company but one thing she doesn't get a ton of is happy mail from customers using her stamps? 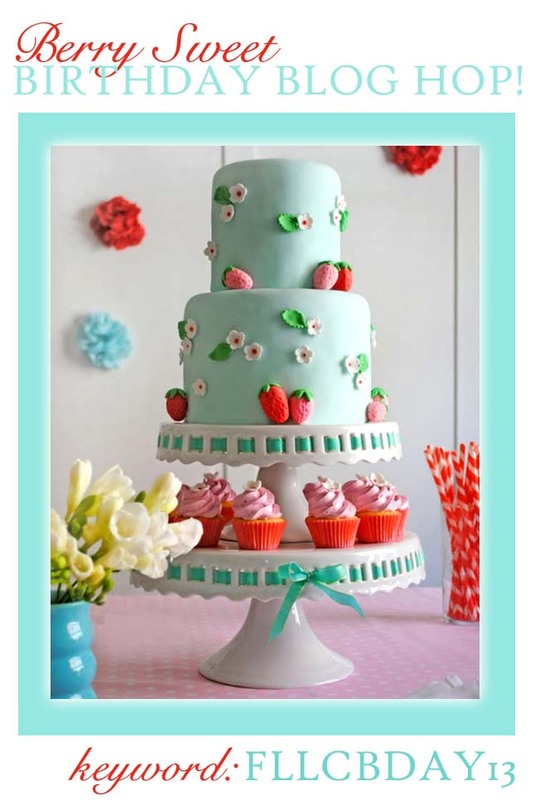 Let's change that for her birthday and flood her with some creative "love" by sending her your Berry Sweet Birthday Blog Hop creations! Here's her address so you can pop them in the mail! I know she would love to see "in real life" what beautiful work you all do and I know it would bring a huge smile to her face! So, join us in singing her a special little birthday song! Be sure to check out all the fun and festive wishes and grab some great ideas for birthday cards along the way! Thanks for stopping by and helping us with Jan Marie a wonderful and fabulous BIRTHDAY on Monday! I finally got to ink up a bit of Carolyn King's new set from Gina K called Stamp it Big! Such an awesome versatile set and I always love the look of small and big sentiments together. I decided to use last weeks Deconstructing Jen's sketch #87 and make it a masculine card. I really just don't have enough of those. 7Gypsies dp collection of Off the Wall was used and I roughed up the edges on the main panel. I finished the card with twine and popped up the sentiment oval once I sponged the edges. Super quick and easy and now another masculine card to add to my stash! Tomorrow is something special, so be sure to check back here to find out what it is and how you can have a chance at winning a $25 Flourishes gift certificate! Thanks for popping in and hope your day is wonderful! 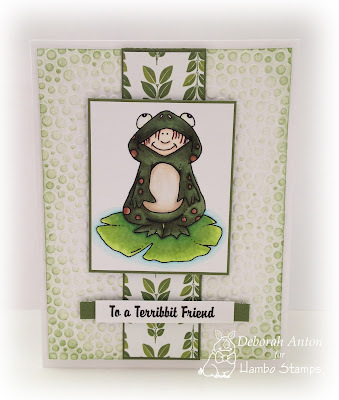 It's time for another Hoedown with Hambo Stamps and this weeks challenge will give you warts! Hee... not really, but with this challenge, you are to incorporate "warts" or bumps into you creation. For my card using Frogboy, I ran the back panel with a CB folder before sponging it over with some Memento Bamboo ink and popping it up. I then used some dp from Scenic Route for the center panel for an accent image. Frogboy is colored in with Copics and popped up with one of the sentiments in this digi set just below. At least it didn't finish with "...you give me warts!" That would be horrible, wouldn't it? A conversation piece for sure if the card were to be displayed. :) LOL! Ok, sorry! Just had to throw in a little funny. We hope you will be able to join us this week at the Hoedown! Be sure to check out what other creations the Bacon Bits came up with!! Make it a great day! I know it's been a little quiet here. I have been enjoying the last few days with my family as today my husband is getting ready to deploy to Afghanistan. After living the military life 13 years of my husbands 17 year career, times like this never get easier. And with children, even that much harder. It's certainly not a lifestyle for everyone, but it's one we chose to live through the good, easy, bad, or hard times. So, today begins another year away from my husband; our children away from their father. We make the best of it- keeping busy and documenting all the happenings of the year. Godspeed to all who are leaving today, serving in country now, and to those getting ready to leave soon after. 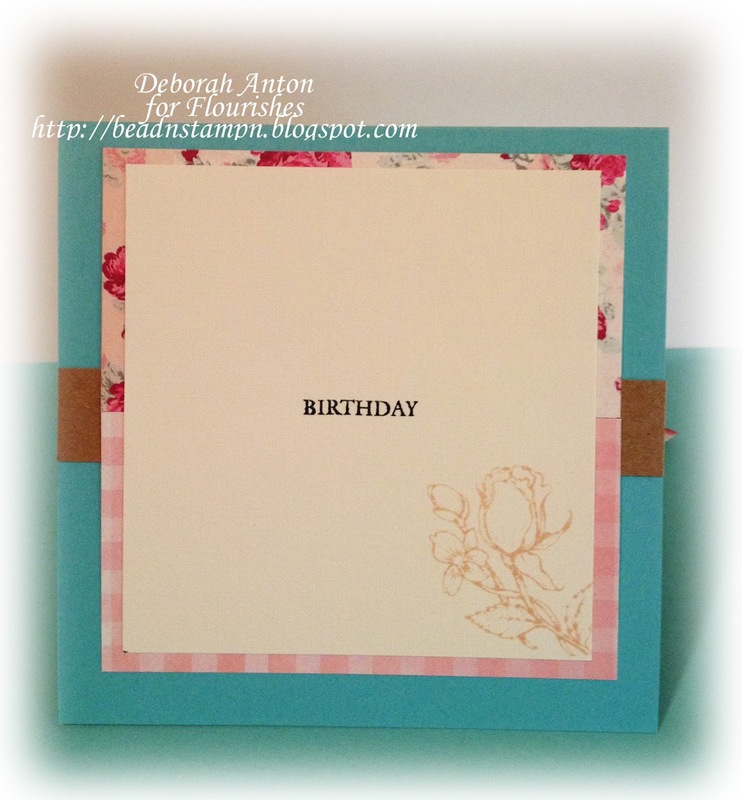 For my card, I used the new Flourishes release of Old Fashion Florals and the sentiment used is perfect for today! Just this word 'smile' reminds me of the song from Charlie Chaplin. It's one of my favorites. I cutout this image and popped it up on the Perfectly Pierced Victorian Ovals die set while coloring it using the Poppy Collection Copic marker set for the flowers and the Leaf Green collection for the leaves. 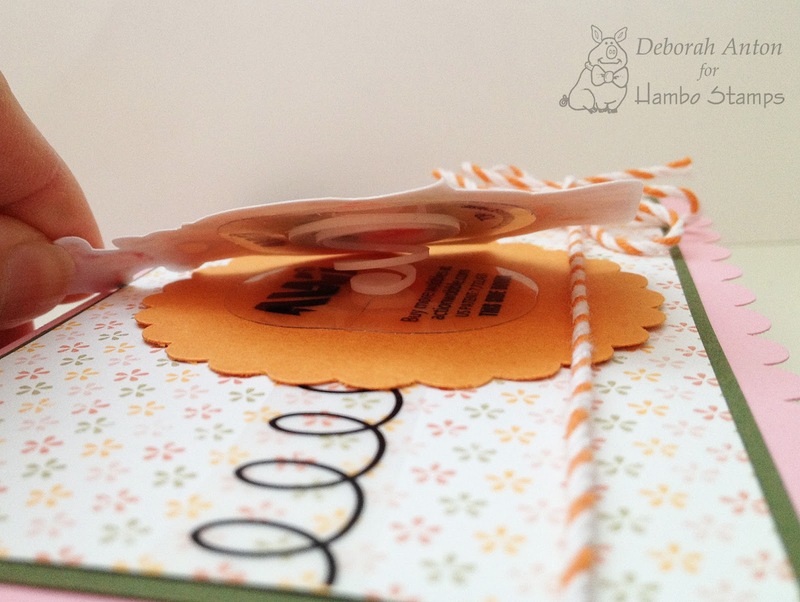 The dp used is Websters Pages finshed with some crochet ribbon and the sentiment stamped directly onto the dp. The Victorian Oval is popped up in the center for some added dimension with some self adhesive pearls from Zva Creative to the edges. I finished the inside to coordinate. I added another sentiment from the set to complete the inside while using my MS edge lace punch for the bottom panel. Be sure to check out the other wonderful creations from the team to inspire you to play along in the challenge! Thanks for popping in to take a looksee and hope you all have a fabulous Tuesday! I am pretty sure this thing is on, but you never know! : ) It's Wednesday and time for another Hoedown! This weeks challenge is a CAS. You all know how I LOVE those, so this was right up my ally! Lot's of white spaces... which scares some who always use lots of panels and embellishments. Not me. I just love the look of white spaces. Did I mention I love it? lol! Here is my card using Microphone. Be sure to join us at the Hoedown and see what the other Bacon Bits have created! Don't forget to upload your card for you to earn your free digi! Thanks for stopping by! I hope you are having a good start to the week and ready for Valentines Day! It's another week of a Timeless Tuesday challenge and your hostess is Maki. The challenge is incorporating hearts into your project. Perfect! 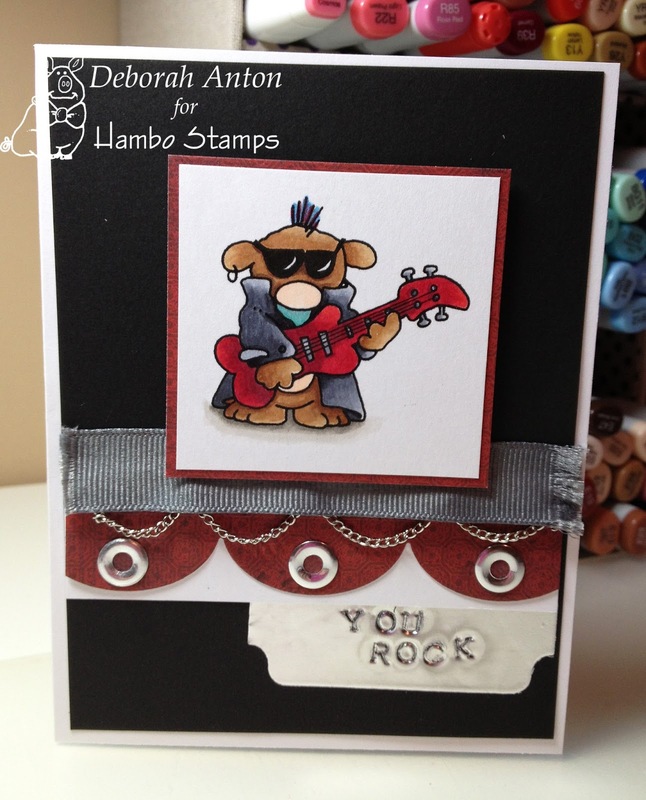 I used Just My Type for this card as the focal point highlighting "I love you" with red Memento ink. The dp is Basic Grey's True Love collection. For my heart, I cut out a red felt heart using MFT's Hearts a plenty die-namics while sewing around the edges of the card. I finished it off with some May Arts lace ribbon and some clear ball accents from the wedding isle of HL. The sentiment panel is popped up. 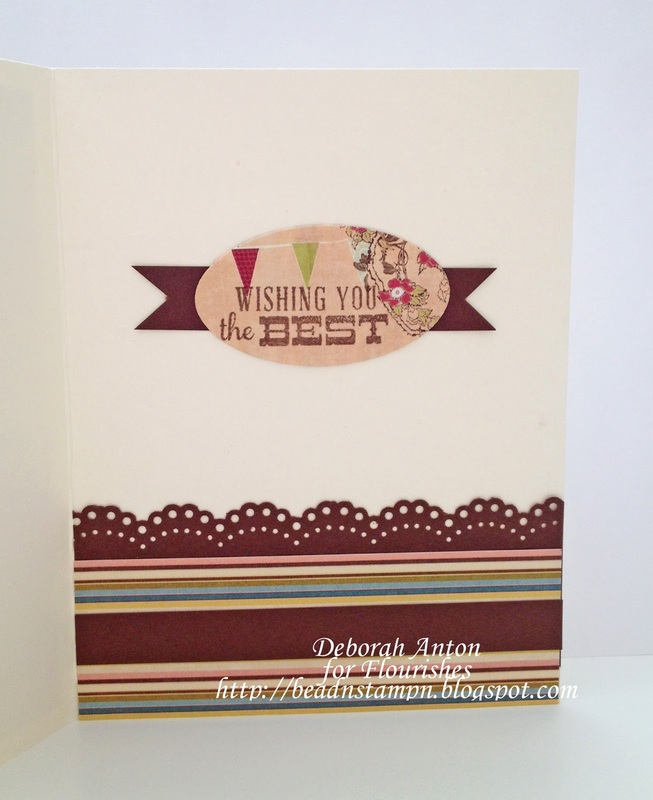 For this card, I used Flourishes Inside & Out You while sewing around the edges a bit wonky with dp from Me & My Big Ideas. I finished the card using some lace ribbon, a red felt heart, and self adhesive rhinestones. Super simple and quick Valentine cards using the fun releases from January. Be sure to stop by the rest of the team to see all the fabulous creations! Thanks for stopping by! Can you believe it? A little beadn came my way! LOL! I only get do that sporadically but this time it was a special request from my special friend Carole (TruCarMa), to have a rosary made with the St. Germaine medal attached. It had been a while since I made a rosary, but it was like riding a bike. :) I really liked how it turned out with the sapphire crystals against the silver. Hopefully, Carole's friend will enjoy and find comfort with this rosary. Thanks for taking a peek and I hope to do a little more beadn soon! Happy weekend! Sorry it has been a little quiet the last few days. My party planning has not stopped since my husbands promotion, as I had an Army meeting luncheon to plan a few days later. Luckily, it was for not as many people my husband had, but enough to keep me busy! Whew... no more parties for me to plan for now! I am spending this weekend creating some new work to share, but in the meantime, thought I would share some table decorations I had done for the food tables. This first one was the start of making the "napkin" bags. 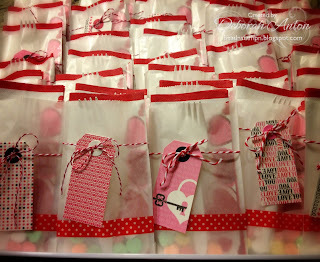 I thought I would use more of those fun glassine bags from SRM Stickers to place a folded napkin, fork, and some candy hearts as the first step in getting food. Here is the tray when I was done. I decorated the bags with a strip of Washi Tape by Queen and Co., some twine from The Twinery, also from SRM Stickers, and some pre-done tags I found at HL. Simple and makes for a nice presentation rather than just picking up a napkin and fork. These two were some simple decorations I made to just jazz up the food table a bit. I once saw some arrows done similar to this and I thought this would be a good easy decoration to do. These were made using some wooden dowels, felt hearts I cut using my MFT's Hearts a plenty die-namics, some feathers, and shimmer twine from the $ spot. I used my hot glue gun to attach it all while wrapping and gluing the twine at the top of the arrows for a more "realistic" look. I filled a tall vase with some conversation hearts before just placing the arrows inside. 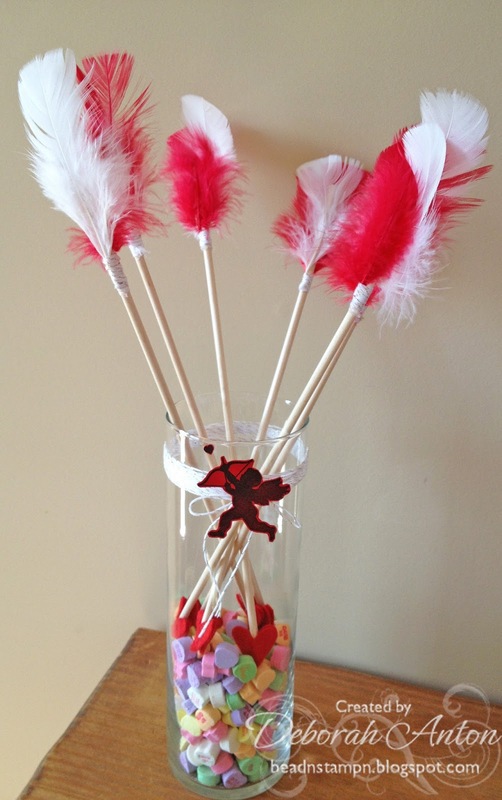 I used my MFT set of Inspired by Love for the cupid which I fussy cut out and wrapped more twine to the top of the vase before attaching cupid. Again, something simple using a small vase filled with conversation heart candies and some pinwheels I made to give it a more whimsical feel. To make the pinwheels, I used some designer paper from Me & My Big Ideas and some plain colored cs from Paper Studio. The center dowel is some heart doilies I picked up which I glued back to back and in the center of both sides, used some red felt hearts. I finished the pinwheels by attaching some ribbon to hang down, a button in the center, and wrapped some ribbon around the vase with another doily behind it, before attaching a cupcake 3-D sticker. All super easy and quick to put together. I hope I have inspired you a bit to create some Valentine décor! Thanks so much for stopping by and have a great weekend! It's Wednesday and it's time to Hoedown! This weeks Hambo Hoedown Challenge is using this adorable Bailey Rocks image and incorporating metal into your creation. 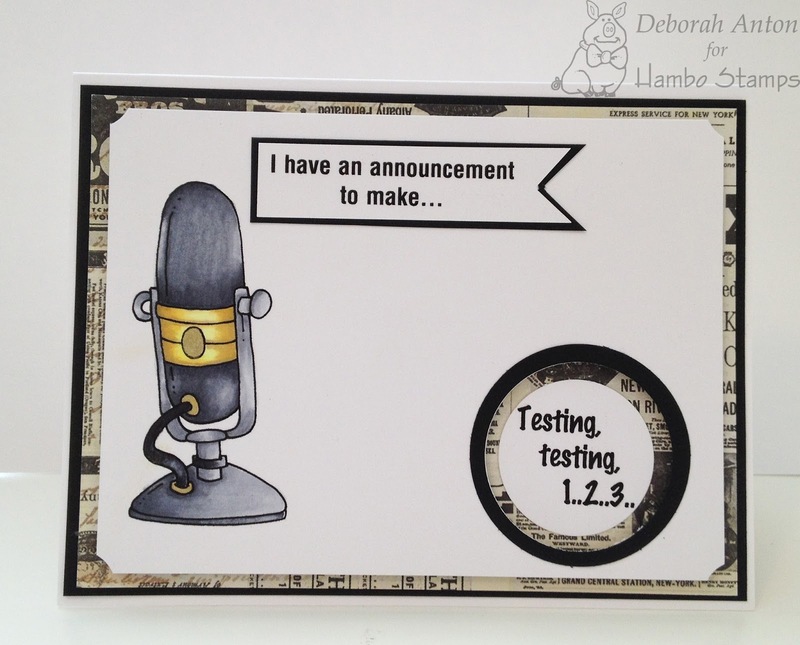 ﻿For my card, I used one of the sentiments and stamped into some metal adhesive sheets using my metal stamps. I then cut it out using MFT's tab die-namic. I mounted the image panel and scallop strip using Basic Grey's Boxer collection. The image was colored with Copics. I finished the card with some ribbon that I frayed at the ends with some metal self adhesive eyelets and some jewelry chain to swag along the bottom of the ribbon. Come join us at the hoedown this week for your chance to be the Queen of the Hoedown and earn your free image! Thanks so much for stopping by! WOW! I am so excited to finally share with you my news of being asked to join the Flourishes Timeless Tuesday Challenge Design Team! Thank you Jan and Julie for this wonderful opportunity. I am humbled to have been asked and work alongside all these talented ladies! Today's Timeless Tuesday Challenge is an It's Sketchy Challenge and Ally is our hostess. 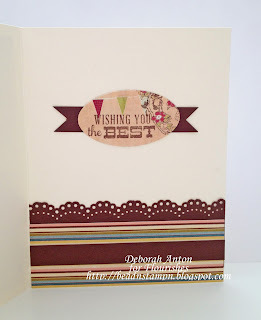 For my card, I used Basic Grey's Sultry collection for the dp and Flourishes January release of Roses are Red. A beautiful set for Valentines Day! Here are the Copic Colors used to color the roses and leaves. The yellows used were Y11, Y21, Y28 and a hint of YG01 and YG03 were used on the leaves with the addition of the Leaf Collection. I cut out the image with my Nesties and finished the card with some self adhesive pearls. Be sure to stop by the rest of the Timeless Tuesday Team for more inspiration. Thanks so much for stopping by and sharing in my news!! Another Term and a SALE! Yes! I have been asked to be a Bacon Bit another term with Hambo Stamps and I couldn't be more thrilled! There is just way too much fun playing in the pig pen with the other talented gals. Come over to Talk to the Ham to see the other new Bacon Bits playing along in the pen this term. Thank you Monica and Judy for asking! Because Hambo Stamps has a special fondness for PIGskin, we're celebrating Super Bowl Sunday (Feb. 3) by offering 30% off EVERYTHING in-stock in our store! PLUS - We're offering a chance to win your entire order FREE (up to $100)! When you place your order, give us your best guess as to the FINAL total of points scored in the game -- that is, the total of points that both teams have scored, added together. If more than one person correctly guesses the exact final point total, a random draw will determine the winner of those with the correct guess. If no one correctly guesses the final point total, it will go to the CLOSEST guess (over or under) -- again with a random drawing if there is more than one. Please note that while the 30% off sale runs for three entire days, only orders received prior to kick-off will be in the running for the free stamps. You must submit your point total guess with your order to be eligible. Don't forget that Hambo now carries clear stamps!! Be sure to check out the selection and add them to your order to take advantage of the sale! !